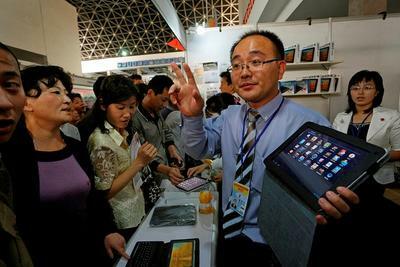 Pyongyang-based electronics company Chosun Computer recently announced North Korea's first Android tablet at the 8th Pyongyang Autumn International Trade Fair. Members of the Associated Press were able to take a photo of the new tablet, but beyond that, not much is known about it. No specs were revealed to by the Associated Press, who did not run a full story from the show, and the only way we can speculate on what the tablet is capable of is based on then icons available on screen. Many common Android icons such as the clock, media player, and settings are available, but any kind of Internet based functions like a browser or email are missing. North Korea does not currently run any mobile broadband networks, and its citizens are able to access the Internet only under supervision. Only one 3G network has ever been available in the country for foreigners use only, but it was shut down in under a month of operation. Even the perceived name, Samijiyon, can be only be guessed because it is written on the boxes in the background of the picture. A representative from Google in Seoul was cited by The Wall Street Journal and noted that such a device is entirely possible, since Android is open-source, but didn't comment much further. So while it might not have Wi-Fi, might not be the most powerful tablet out there, and might not even be obtainable in any other country, is there anybody still interested in owning it? It might be fun to toy around with just to see how technologically far the isolated DPRK has advanced in comparison to its rival in the south.